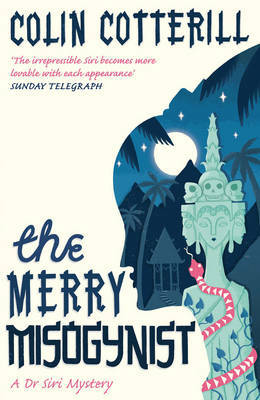 The title THE MERRY MISOGYNIST has to be the best title I've seen that refers to a story about a serial murderer of women. In 1978 in Laos, record-keeping by local police is achieved by writing in ledgers, which are only sent up to central records once the ledger is full, and even then is not likely to be cross-checked for similar crimes in different areas. This is an ideal situation in which a serial murderer (the Merry Misogynist of the title) can go about undetected with ease. Besides which, the murdered young girls are left naked and tied to a tree, and are often not discovered until they are just a pile of bones, leaving no trace of the murder. Until, that is, a fresh body is found and delivered to the mortuary run by Laos's one and only coroner, Dr Siri Paiboun. Not only is Siri shocked by the murder, he faces the further difficulty that the identity of the girl is unknown, and he has a challenging case on his hands. In common with many books about serial murderers, this is not just about discovering the murderer, before he can commit another crime, but about discovering his modus operandi, what has driven him to commit his crimes, and how he has managed to remain undetected so far. Siri has to use a novel set of strategies, given the setting of this book, to do this. For example, he uses the Women's Organisation to find out if there are rumours of similar crimes, to discover if any of them resemble those of the unknown girl and work out if there is a pattern. Remarkably efficient, they report back within just three days with some possibilities. Meanwhile, having just married his old sweetheart Madame Deung (noodle maker), Siri now spends most of his time at her house, and has to try to avoid trouble from the authorities for renting out his old house to a bunch of misfits. He and Madame Deung also have to search for an old friend 'Crazy Rajid', a character from an earlier book, who has disappeared. And, if all that wasn't enough, the spirit of Siri's old dog Saloop, long since dead, keeps appearing to Siri at odd moments, frightening him into believing that this is a omen warning him that his own death is at hand. THE MERRY MISOGYNIST is an enjoyable mix of simple everyday problems to be solved, the race to find a friend before something bad happens to him, together with the real problem of solving a serial murder - which ends in a nail-biting climax. Colin Cotterill's books are gentle, amusing and entertaining reads, and this one manages to put a new spin on an old theme very successfully indeed.